Astrium ‘Janus’ experiment Astrium’s Janus payload is designed to demonstrate the feasibility of using space-based cosmic radiation to produce true random number generation in satellites for the first time. Random number generation is an essential component of secure communication systems and the Janus payload could pave the way for highly-secure telecommunication satellites. The Janus mission will also act as a technology demonstrator to determine the effects of cosmic radiation on a high performance integrated circuit in the payload – a Xilinx Field Programmable Gate Array (FPGA). The FPGA has the potential to be re-programmed in orbit and therefore could lead to further advancements in the payload’s overall functionality. CMOS Imager Demonstrator The Open University’s CMOS Imager Demonstrator is based on new sensor technology which is being developed and evaluated for space use. 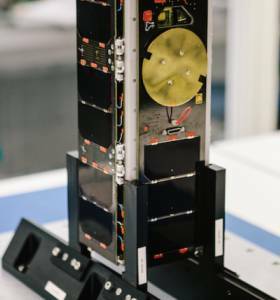 It is designed to perform a variety of imaging tasks and will take images of the Earth and test the effect of radiation on instruments in space. myPocketQub UKSEDS myPocketQub is a pocket spacecraft that will carry a stack of different experiments, allowing students and hobbyists to take part in a space mission. The three core goals of myPocketQub are to allow up to 365 people to try their experiments in space on a pocket spacecraft for a day; help people to develop payloads for pocket spacecraft at home, school or university; and demonstrate an open source pocket spacecraft design. TOPCAT TOPCAT, a project from the University of Bath, will be the first GPS device aimed at measuring space weather conditions in the plasmasphere (the areas of space just beyond the earth’s atmosphere). FUNcube The FUNcube sub-system provides UKube with the capability for educational outreach to students at schools and colleges and also a” redundant” communications system. A simple “ground station” receiver is also already in manufacture. This has been developed to allow direct reception of the FUNcube signals from space. The receiver is actually a USB dongle and will be made available economically for educational purposes. Display software and support material is also being developed so that the whole experience will be stimulating for the children and encourage their interest in all STEM subjects. The development is being undertaken and financed entirely by volunteer members and friends of AMSAT-UK. Launched and Active. UKube-1 has ‘booked’ its journey into space on a Russian Soyuz-2 rocket. The launch from the Baikonur Cosmodrone in Kazakhstan is expected to take place in June 2013. The launch of Soyuz-2-1B/Fregat-M from Baikonur in Kazakhstan has been postponed until June 28, 2014, with the following day as a back-up. The launch time has been quoted as 15:58:28 UT with separation some 9253 seconds later. The Soyuz should carry Meteor-M number 2, MCA-PN2 (Relek), M3MSat, UKube-1, SkySat-2, TechDemoSat-1, AISSat-2, DX-1. Both UKUBE-1 with CW and FUNcube-2 onboard of UKUBE-1 with BPSK are active. 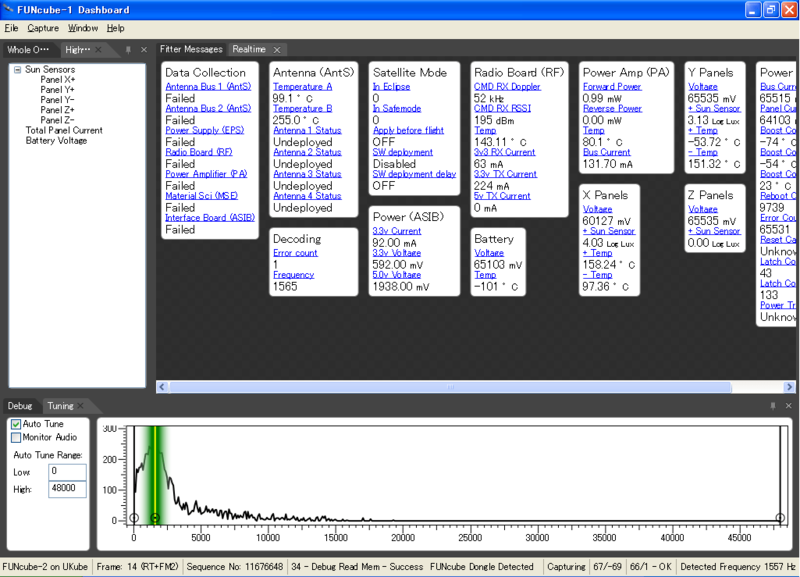 The BPSK data can be decoded with the latest FUNcube dashboard software.